Today, Anna Fowlie, CEO of SCVO shares her reflections on Workforce Scotland, inspired by last weeks blog by Janet Whitley. Anna chaired the Workforce Scotland Steering Group from 2015-2018. Janet’s thoughtful reflection gave me pause to think back on my involvement in Workforce Scotland and the progress we’ve made over the last few years. My involvement started with the unfortunately named “Colloquium” and then the first steering group, chaired by the inimitable Justine Curran, then chief constable of Tayside Police. Justine described it as knitting fog. While we weren’t totally great at concrete actions, some things did happen around collaborative learning, Skilled Workers, Skilled Citizens and Employee Engagement. And we were united by a determination to change things. My determination has always been to get people working in public services, whoever they were employed by, to feel they were working for the people of Scotland first and foremost and to sign up to a set of shared values (preferably those on the Scottish mace). We’ve yet to crack that nut. How we’ve gone about things has always been a bit unorthodox, and I for one have always found the “kaftan of weirdness” a wee bit itchy and ill-fitting. It didn’t always sit well with colleagues across different sectors, but there were always a brave few who were prepared to give it a try. And that’s what we have relied on – people giving stuff a try. If it worked, great; if it didn’t, learn and move on. Things are in a different place now. We might not have fully implemented the Christie Commission’s recommendations but we now have a much clearer focus on the citizen and an acceptance that the workforce has to be right at the heart of reform, not an afterthought. That’s got to be a good thing and I look forward to seeing more progress. Janet Whitley, Head of Ingage Team, Scottish Government, shares her reflections on the journey of Workforce Scotland. Very often there are things that happen in our lives that cause us to look back and reflect, reset our priorities and bring new energy around these. Some colleagues will be aware that I was away from work for a spell last year with breast cancer and that is certainly one of those triggers to think over what is important, what brings me energy and what is it that I enjoy doing. We know that we face a number of complex, wicked issues in Scotland, such as poverty, an aging population and climate change, and we know that no single organisation or agency will be able to tackle these alone. 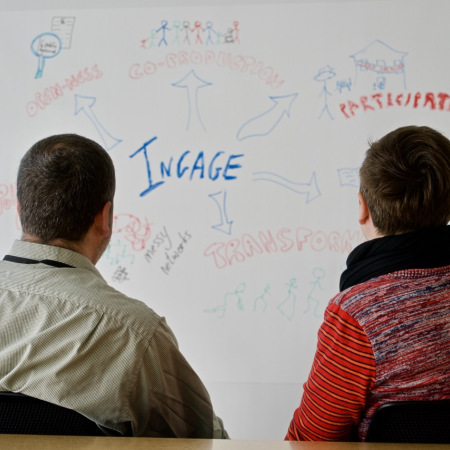 We understand that we must work collaboratively to affect change, and that this work is often complex, messy, unpredictable, and can be difficult to achieve. We know that creating the time and space to work collectively can be challenging. The day to day work can override our best intentions, and we can get stuck in our traditional habits and ways of thinking and doing. We have been running a few information (taster) sessions about Collective Leadership so we can engage more widely with those interested in collectively tackling ‘wicked issues’ in public services. We’ve had lots of interest from a diverse range of colleagues: those in leadership roles grappling with very complex issues; those interested in how we can develop the facilitation capacity which is central to the Collective Leadership Offer; and those interested in our burgeoning faculty – who will help us develop a systemic model of learning and evaluation. think about who is part of the collective leadership around this challenge? Our sessions are planned for a couple of hours but we have found that the interest in the work means that we are often staying on a little bit longer, exploring opportunities and next steps.